The International Medical Association Bulgaria has been founded in Varna - Bulgaria in 1990 with the idea to build a bridge between the medical people of Bulgaria and those with bulgarian origin who live and work abroad. Germany, France, Norway, Italy, Greece, The Netherlands, Austria, UK, Switzerland, Macedonia, Israel, USA, Chile, Australia. Of course, the bridges got together not only medical people with bulgarian origin but also any other who had some sympathy and sentiments for Bulgaria. Very active relations have been introduced between IMAB and similar organizations, like: the Israel Medical Association, Hadassah Medical Organization, International Society for Chemotherapy, USA Kidney Foundation, ESMID, EANO, UICC, etc. Fruitful contacts have been realized between IMAB and many foreign universities: Munich, Heidelberg and Aachen (Germany), Tel Aviv and Jerusalem (Israel), Utrecht (The Netherlands), Brussels (Belgium), London and Glasgow (UK), Chieti, Milan and L’Aquilla (Italy), Thessaloniki and Athens (Greece), Bratislava (Slovakia), Vienna (Austria), New York, Chicago and San Diego (USA), Oslo (Norway), Santiago (Chile), etc. qualification of bulgarian physicians and dentists abroad: until now, for the 10-year period (1991-2001), IMAB has sent over 250 medical people (mainly young!) to many foreign countries for specialization, exchange visits, congresses, symposia, research projects, etc. Our qualification programmes include a long-term specialization in foreign university hospitals (up to 1 or more years), shorter study projects (3 to 6 months), working visits (15 to 30 days) - they all are fully provided with stipends, license, mal-practice, insurance, accommodation, etc. based on the agreements IMAB has with its partners in Israel, Germany, USA, Norway, etc. IMAB has also intensive courses of English in London (UK) for those who need higher language level. organization of many scientific meetings in Bulgaria with the accent on the Annual Assembly of IMAB which is always dedicated to St. St. Cyril and Methodius (24-th May, National Day of Bulgarian Culture, Education and Science). The Assembly gathers hundreds of bulgarian and foreign medical specialists, including presidents of medical societies, rectors and deans of foreign universities, distinguished professors and lectors. The sessions are in all major fields of medicine, with plenary lectures, oral and poster presentations, workshops and seminars. Every year IMAB organizes many conferences on specific topics in different towns of Bulgaria, thus giving the chance of many medical people from the country to meet the invited guest-lecturers from abroad and to discuss interesting themes. IMAB has a well-established system of paying respect to those bulgarian and foreign members, contributors and sympathizers, who deserve our thanks and warmest attitude. 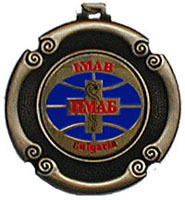 The awards vary, depending on the case and level of consideration: diploma of honour, memorable desk-top, Jubilee Medal of IMAB, prestigious title “Honorable Professor of IMAB”. The nominations and decisions are introduced and announced during the Annual Assembly of IMAB every year.